After negotiations between senator Bemba and the Congolese and Portuguese governments, the DRC senate authorised the departure of Mr. Bemba through a document signed on Tuesday 10 April, by its provisional president Mr. André Mueshi Kuongo. Once the authorisation was granted, the Portuguese government gave their agreement for Mr. Bemba's evacuation. For his part, Mr. Bemba gave assurances in relation to his conduct while abroad, in a letter addressed to the Portuguese government. At the demand of the Congolese government and senator Bemba, MONUC assured his security as he and his family made their way from the South African embassy to Kinshasa's N'Djili airport. Mr. Bemba had taken refuge in the residence of the South African ambassador since 23 March last, following the outbreak of violent conflict in Kinshasa between his guards and the Congolese Armed Forces (FARDC). The conflict left hundreds dead and wounded, with much damage to the city, principally caused by the looting that accompanied the violence. 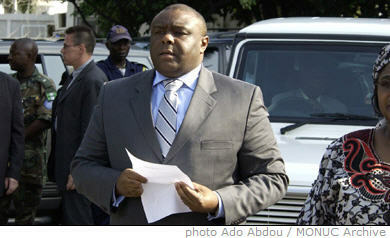 Mr. Bemba, as losing candidate in the DRC presidential race with 42% of the vote, is the principal leader of the political opposition through his political platform - the Union for the Nation (UpN) - which was largely outstripped by the alliance for Presidential Majority (AMP) of President Kabila in the legislative, senatorial and provincial elections.